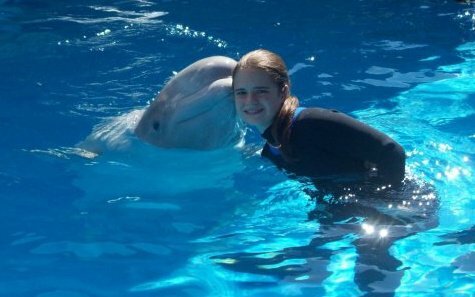 The author (me, Jenna) get all smooshed up with Whisper the beluga whale at SeaWorld San Antonio on August 10th, 2010. I am a psychology major at Nashua Community College in Nashua, NH. Ever since I was five years old, I have always wanted to work with animals, especially orcas. However, as time went on, I began to put my interest on other animals too such as dolphins, belugas, and sea lions. At the same time, I began to gain some experience working with animals through SeaWorld camp programs, a DolphinLab at Dolphin Research Center in the Florida Keys, and a number of job shadows at a handful of places such as New England Aquarium and Theater of the Sea. One of my main goals as a trainer is to not only develop a relationship with the animals, but to also inspire people to know, love, and care about them and their habitats. About the Blog: I originally started the blog in 2011 to keep people updated on my experiences as an intern at Clearwater Marine Aquarium. However, as time went on, I realized that I needed to also blog about other facilities too such as SeaWorld, Mystic Aquarium, and so on. In addittion to that, I also share my knowledge about marine life, animal training, care, and husbandry, share memorable stories about my experiences with animals both in the wild and at zoological facilities, and profile those who are members of the marine zoological community. Glad I found your blog. The Clearwater Marina Website does not really update information. It would be great if they would and give us updates on Hope, Winter, Panama and even Nicholas. I have a ton of questions, for instance…have they put Hope and Panama together yet? Is there video anywhere about the rescue of Hope? All sorts of questions like that and the website is just not conducive to finding out this information. As I non-profit, I know they have to use their financial resources better, but even if on facebook something they could just give a short paragraph or so about what is happening at the Aquarium; any recent rescues. I’m in PA and although I am far away I think of the work of that place almost daily. Anyway, Jenna, just me thoughts.